Whether you live in Phoenix or you’re here for the winter months, unexpected car accidents typically cause painful injuries that can affect you for weeks and years to come. Some types of injuries are common in car accidents. When you or a loved one are injured in an auto accident, you will need to work with an experienced personal injury chiropractor to attend to your injuries as well as document your injuries to fortify your personal injury claim. Your insurance or the at fault driver’s insurance are required to award you compensation for your injuries and restore your life to normal. Here are the most common types of car accident injuries in Phoenix Arizona and what you can do to avoid them. As a result of a car accident you can suffer scrapes and cuts. You may receive cuts from the impact of the vehicles involved. You could suffer cuts scrapes or contusions from loose flying projectiles inside the car. Either way, scrapes, and cuts tend to be painful and your car accident chiropractor will need address the possible risk for infections and other complications. In closed head injuries meaning your skull is not fractured you must be examined to rule out TBI (Traumatic Brain Injuries) and other brain injuries. These soft tissue injuries can cause immediate complications that linger into the future. If not properly treated immediately TBIs can cause headaches, sleeping as well long-term problems with brain function. It is difficult to diagnose a brain injury, and to avoid complications you should seek chiropractic physicians who actually look to rule out TBIs in any and all car crashes. You can’t find a Traumatic Brain Injury unless you are looking for these types of injuries from thee get go. Does your physician have the get go? Ribs can be injured due to these same sudden traumatic forces. Mild to modest trauma can cause ribs to fracture because of how fast these injuries occur in motor vehicle collisions. You might suffer broken ribs in a car accident and broken ribs typically are very painful and require lengthy periods of repair because they are constantly moving when you breathe. It is not uncommon to see other broken bones in your body in a phoenix car accident which is caused by the speed of the traumatic forces on your body. When these traumatic forces are more than your bones can withstand, you can suffer fracture. In all types of car crashes including rear-end and side-impact accidents bony fractures are common. Internal bleeding is always dangerous especially if it’s not treated immediately if not sooner following motor vehicle crash incident. It’s important to seek medical attention immediately for any type of car accidents. If anyone involved in the accident suffered internal bleeding, critical care is crucial to rule out life-threatening injuries. Disc injuries occur in car accidents if you or a loved one where involved in a car collision you may have suffered a herniated disc. A herniated disc injury occurs once again because of the type and quickness of the traumatic forces produces when to moving objects collide. A herniated disc is painful and affect you in a way to send pain down your arms or legs or even around your rib cage. 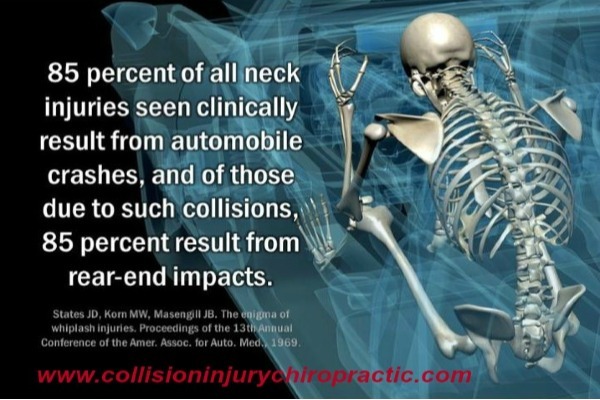 The neck discs are most susceptible to car accident trauma compared to your mid back or low back discs. The sudden impact of a crash causing your knees to strike the dashboard that car manufacturers have placed knee airbags or under the dash airbags to help prevent knee injuries. Knee injuries can occur to the muscles, ligaments, and all bones of your knee including your kneecap. Knees seem to be simple but injuries to the knee are complicated, and are especially frustrating because they can cause pain, internal damage which results in difficulty walking. Not all injuries sustained in MVA (motor vehicle accident) are physical. MVA victims can suffer from mental and emotional injuries. This is called post-traumatic stress disorder (PTSD), and routine activities may become troublesome and even unbearable. Recovering from PTSD typically requires mental health treatment. PTSD accident victims typically become a different person and certainly will not recognize these symptoms without feedback from loved ones who know they suffered in a collision. To confuse matters even more someone might suffer PTSD and and the other injured party might not suffer with PTSD. These patients might not want to drive, or they might not want to be a passenger because they just can’t trust the other driver. They may have feelings of guilt for suffering PTSD and no one else in the car has PTSD. Mental distress and symptoms are very real injuries that can be caused a car accident. It’s crucial to seek out the proper treatment and manage any mental injuries in addition to physical injuries sustained. No one has control over other drivers on the road so first things first always always always wear your seatbelt. Seatbelts have proven to absolutely positively save lives. Pay attention the speed limit. Crashes that involve higher speeding drivers typically are much more severe than if drivers were driving the speed limits. Also don’t be a slow poke on the roads you should be driving at the speed limits or at least as close to it as possible. If you are driving to slow that will cause other drivers to want to pass you and that can cause traffic accidents also. It is essential to keep up with your vehicle maintenance. Take care of everything so your car is in excellent working order. Check tire pressure and tire tread wear. Hey, we live in Arizona check for windshield wiper sun damage as it occurs and not because it only rains for about 2 days a year here. You can avoid accidents by making sure your car is in the best working order as possible and if other drivers aren’t doing this at least you will be. Seek Chiropractic and medical treatment as soon as you can following a car collision. Be aware some injuries take time to express themselves. You can absolutely be seriously injured and not realize it. Just because you are not bleeding doesn’t mean you have not sustained injury. Getting an evaluation from a personal injury chiropractor who is trained to seek out hidden injuries before they become more serious without treatment. You should seek chiropractic treatment after all traffic crashes, even if you think you didn’t suffer injury. You also can be injured without having pain immediately after an accident!! Another reason it is smart to seek treatment immediately following a motor vehicle traffic accident is medical documentation of any of your injuries sustained and most importantly documenting how much care and treatment you will need. Also how long it will take for your injuries to heal. The injuries you sustain from an auto accident affects soft tissue as well as bony tissue. Soft tissues have different blood supply and therefore different healing propensities. Proper healing takes time and being under a treatment plan that changes as you heal is the best way to return to normal. Chiropractic health records also documents your injuries to build your case for a fair recovery. How Can Car Accident Chiropractor Help Me After a Car Accident? 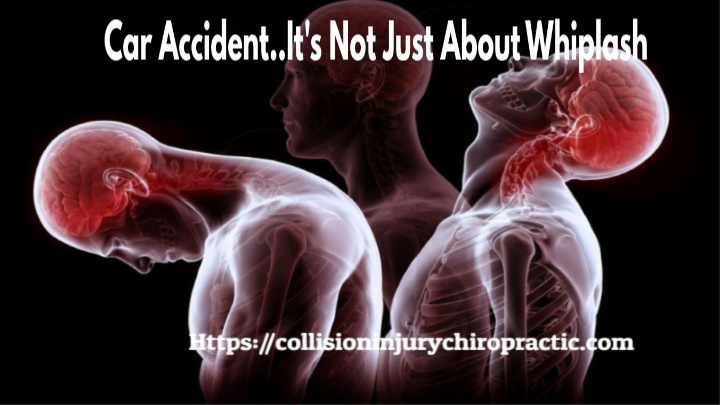 The Personal Injury chiropractors at Collision Injury Chiropractic are trained in all aspects of diagnosing, treating and management of all aspects of the accident victim’s health as discussed in this article. Give us a call if you or a loved one have been involved in a car accident.